occasion with former First Lady Michelle Obama making that big appearance nearby host Alicia Keys. 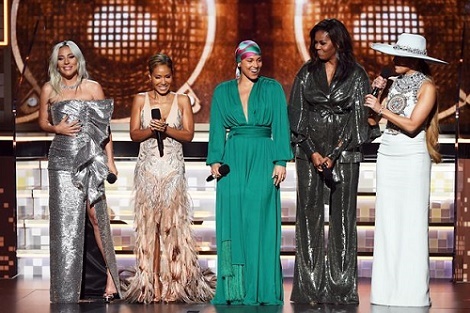 The 55-year-old showed up close by Lady Gaga, Jennifer Lopez and Jada Pinkett Smith, as them four talked about the significance of music in their lives. Michelle is reportedly a good friend of Alicia and the singer had been to the White House on a couple occasions, while the Obamas were in power. Alicia introduced the segment at the ceremony by saying: "Music is what we all love, music is what it’s all about. "Everybody is out here shining and I’m so proud to bring us together to honor this moment because music is what we cry to, it’s what we march to, it’s what we rock to, it’s what we make love to. Gaga and JLo shared their thoughts on this matter, followed by Jada but the biggest reaction was given to Michelle, who spoke out. 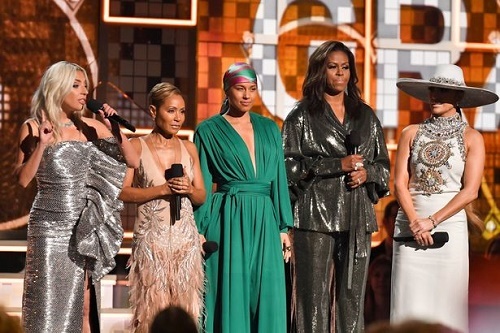 She said: "From the Motown records I wore out on the South Side to the Who Run the World songs that fueled me through this last decade, music has always helped me tell my story, and I know that’s true for everybody here. Michelle continued: “Whether we like country or rap or rock, music helps us share ourselves, our dignity and sorrows, our hopes and joys. "It allows us to hear one another to invite each other in. With the four of them on stage, Alicia referred to Beyonce's song when she playfully said: "Who run the world?"